On this disk we have the original pilot of Star Trek in a number of formats, there is the restored version which is fully coloured, an extended version and the original unaired pilot all of which make interesting viewing but I stuck to the restored version with enhanced effects. One thing is for sure the level of production in terms of filming was top notch, this gives the restoration and remastering gurus a superb starting point to provide us with a visual feast in this 4:3 HD image. The story as you may know begins with the Enterprise commanded by Captain Pike (Jeffrey Hunter) feeling restless after mission which hadn't gone well, the ship receives a distress call and they fling themselves into the void to rescue these people. 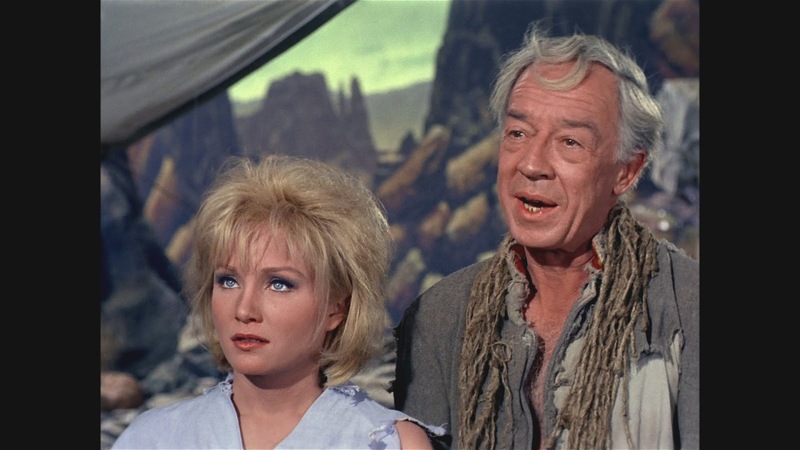 On arrival they find a crashed ship and some survivors plus a young woman named Vina played by Susan Oliver who immediately captures the attention of Pike who is then kidnapped by aliens and the survivors vanish having been an illusion. What follows is the Talosians trying to "tame" Pike into becoming part of the captive lifeform programme who in turn provide this telepathic alien race with knowledge and entertainment. The Cage is an excellent piece of science fiction entertainment but can understand why at the time the NBC network wasn't interested in this style of programme but credit where it is due all parties could see the potential in the basic idea of a united human race exploring our galaxy. The second pilot is also included on this disk and is very different from The Cage but the core ideals are still there but approached from a slightly different angle ramping up the action and emotion while still retaining a level of sophistication. This time I watched the original version without the enhanced graphics and it still held up well, some of the TV episodes proper really benefited from the new CGI but this pilot didn't. Final thoughts on Star Trek the original series are simple, really enjoyed the re-watch and only skipped one episode which is a remarkable ratio given the age and style of the show when compared to the latest televised scifi on offer. Season 1 is probably the strongest but the second season isn't that far behind while the third season has some gems despite the slashing of the budget and change at the helm, I'm certainly not going to condemn anyone involved at the time, they gave us more Star Trek. The Blu-ray boxset is a thing of beauty, awesome picture and sound quality and the only let down is the packaging itself, cheap and nasty cardboard slips. these were the voyagers of the Starship Enterprise. Next a more reckless style of space travel via the Tardis.